Sonicare Flexcare Platinum vs Sonicare Diamondclean Comparison: Which one to go for. 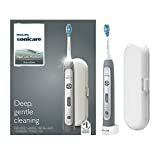 One of the most defining features of these electric brushes though is the Sonicare App, which allows the user to connect the brush with the phone for an even more convenient brushing experience. namely: clean, white and deep clean. model) and Gum & Tongue Cleaning (on 9500 and 9700 models). The DiamondClean Smart also offers a range of comprehensive smart pairing of brushing modes to the brushhead you want to use. You are free to choose from SoniCare DiamondClean Smart’s 3 main models that include the DiamondClean Smart 9300, 9500 and 9700. There is not much difference between the three Smart series models. The key difference is the number of brush heads that are included. four cleaning modes (gum health that runs for 3 minutes and 20 seconds, deep clean goes on for two minutes and gives you BrushPacer feedback after every 20 seconds. When in non-connected mode DeepClean+ runs for three minutes and gives feedback on the BrushPacer after every 30 seconds, white runs for 2 minutes and 40 seconds and clean goes on for a flat 2 minutes) and four colors: Pink, grey, black and white. Four brush heads, one of them being a tongue cleaner. It has similar cleaning modes and color choices like the 9300 but with an extra tongue cleaning mode called tongue care. The 9500 (HX9924/11 ) is a complete oral care solution since it caters for both gums, teeth and tongue and has three intensities to suit your different needs. 8 brush heads for your oral complete care(3 premium gum care, 2 premium plaque control, 2 premium gum care brush heads and 1 premium tongue care plus tongue brush, adding up to 8 brush heads in total). Deluxe travel charger and glass charger. To use the 9700 Series brush effectively by two users, the other user should have their own devise and app to track individual cleaning regimes. The great thing with the new DiamondClean series is that you can use the touch up feature to increase the brushing time if you ever needed to. a stitching embedded design. The face-plate mainly features a power button, LED lights (for showing different brushing modes and battery status) and a special button for changing brushing modes and intensity settings. In terms of appearance, the FlexiCare Platinum looks more standard and clinical than its DiamondClean Smart counterpart. the same shape and size. However, there are many visible differences when it comes to button configuration, cleaning mode layout and color options. only (but with golden upper and bottom rings,) as it’s a new product that’s currently on flagship. their teeth using Bluetooth technology. The SoniCare app basically supports such features as location sensor, touch up, scrubbing sensor and pressure status. where you’ve not brushed yet. If you’re a smartphone savvy individual, then you can use this app, together with the SoniCare electric brush series, to make your brushing experience more fun and convenient. clean your teeth based on your unique circumstances and/or needs. You can enjoy such modes as Clean, White, Deep Clean, Health Mode and even Gum Health and Tongue Cleaning. These modes can literally help clean and take care of any type of teeth and mouth cleaning. Their handles also offer 3 modes of intensity, which allow you to select one that’s comfortable and that can help you achieve maximum teeth cleaning. This feature is designed to remind the user with a light up or vibration, when he or she is applying too much pressure on the gums. You can only imagine the kind of danger and risk you’re exposing yourself to when you damage your gums and are using an electric toothbrush. 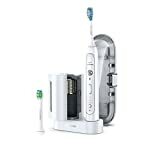 So the pressure sensor ensures the pressure on the teeth and gums is well balanced during brushing thus eliminating this risk. 8 brush heads with multiple brushing options including a tongue brush. allow you to charge your brush handle with USB while on-the-go.